Well, all good things must come to an end and I'm sad to say that this is my last month on the Creative Crew team. It's been such an honour to be part of this team and also very enjoyable - I'm going to miss it but wish the new team all the best - I know they'll come up with lots of beautiful inspiration for us all. Vacation, summer play, family fun times, swimming, canoing, camping, family reunion gatherings (invitations?) and whatever else you can conjure up to signify the celebrations of Summer! Not a scrapper? 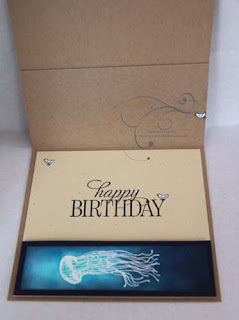 Anything 3-D, mini-albums, giftables, fun fold. Whatever it is .... no stressing ... just have fun! Yes, that's me! I don't know where I found the dead fish but I clearly wasn't too impressed! Eventually I gave up on the idea of a scrapbook page but the photos had me thinking about my childhood. We lived in a "seaside resort" (more correctly - the Thames Estuary!) and were lucky enough to have one of the much sought after beach huts which had a little kitchen so that my grandmother could have her cup of tea at the beach! I used to avoid putting my feet down once I'd started swimming because they would sink into soft, silky "mud" and my imagination used to work overtime thinking about what my toes might encounter there! Mixing with the Ozone odour would be the aroma of fish and chips with vinegar and there was the sound of the waves and laughter overlaid with the cries of the sea gulls wheeling overhead - always on the lookout for dropped or abandoned food. So I recreated my beach scene on a 6" square card front of Crumb Cake. I made three white rectangles which I dressed with little strips of coloured card to create roof lines and gables - then I trimmed off the excess white along the roof line. The doors are a simple rectangle of matching card with a Candy Dot handle. The colours are Pacific Point, Real Red and Night of Navy. 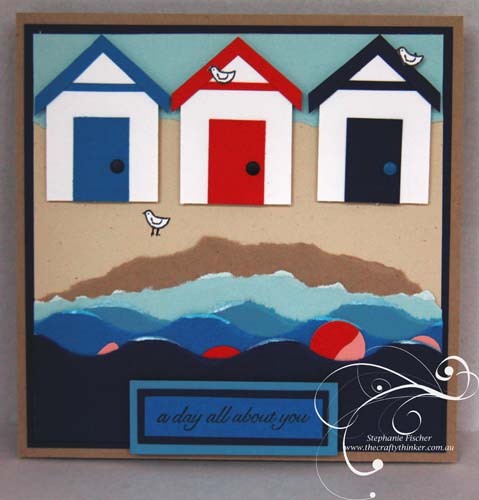 The "sea gulls" are stamped in black on Whisper White using the little bird in the Sprinkles of Life stamp set. I drew in legs with a black Stampin' Write marker for the bird standing on the sand. The dry sand is Naturals Ivory cardstock (which I've since realised is retired) to which I stuck a torn piece of Crumb Cake for the wet sand. Then I tore strips of blue card stock: Soft Sky, Marina Mist, Pacific Point and Night of Navy. The three darker shades I tore into curvy waves and the lightest shade, breaking on the sand, I tore a bit less curvy. The other part of the torn Soft Sky card I turned upside down to become the sky. I added white caps (or surf) to my waves with White Craft ink (which took a long time to dry!). Swimmer - who knows what lies beneath! While the surf was drying, I thought about how to build my swimmer and it turned out to be easier than I expected! I punched 3/4" circles in Real Red and Blushing Bride and a 1/2" circle in Blushing Bride. I cut a piece off the red circle to form a swimming cap which I stuck to the pink circle of the same size. The small piece I had cut off became a bottom! I cut two pieces from the smaller pink circle to form a hand and foot. Then I distributed the bits of swimmer between the waves. I used the jellyfish from the From Land to Sea stamp set to represent my childhood fears of what lay below! I clear heat embossed it on Whisper White and then sponged with Pacific Point and Night of Navy. I stuck this to a piece of Night of Navy cardstock and, with the use of dimensionals, this became the mechanism to hold up the easel card. 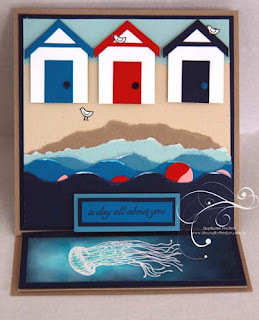 I stamped sentiments from Happy Birthday Everyone to complete my day at the seaside birthday card for my very dear friend of more than 50 years! I hope you like it. 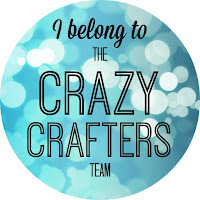 Please join in the Challenge over at Splitcoaststampers!